Mouser now offers the Uno WiFi Rev 2 from Arduino. The first AVR-based natively enabled IoT board from the company, the board integrates an 8-bit microcontroller, Wi-Fi module, sensors, and hardware-based security in the familiar Uno Rev 3 form factor. The new board meets the wireless connectivity and low power requirements of the growing IoT market. The board is based on the new Microchip Technology ATmega4809 megaAVR microcontroller. The device offers CIPs and an integrated high-speed ADC with voltage reference for faster conversion of analog signals. The microcontroller also offers more memory than on former Uno boards, boasting 48kBytes of flash and 6kBytes of RAM, plus three UARTs to allow communication with more than one RF module. The device incorporates a U-blox NINA-W13 module with integrated TCP/IP protocol stack to provide 802.11b/g/n Wi-Fi connectivity allowing access to a Wi-Fi network or for use as an access point. 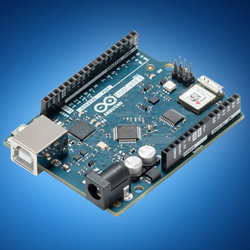 The board also features support for OTA programming for transfer of Arduino sketches or Wi-Fi firmware. Wireless security is implemented by a Microchip ECC608 CryptoAuthentication IC, which couples hardware-based key storage with hardware cryptographic accelerators to perform authentication and encryption protocols. Other features incorporate onboard debugging, an inertial measurement unit (IMU) with three-axis accelerometer and three-axis gyroscope, 14 digital input/output pins (six PWM outputs), and six analog inputs. Devised to ease deployment of designs that need Wi-Fi connectivity, the device is perfect for prototyping IoT applications such as smart agriculture, smart home, motor control, automation, wearables, and other open source projects.